Install Windows Vista. Best Operating Systems. What is Operating System or OS? 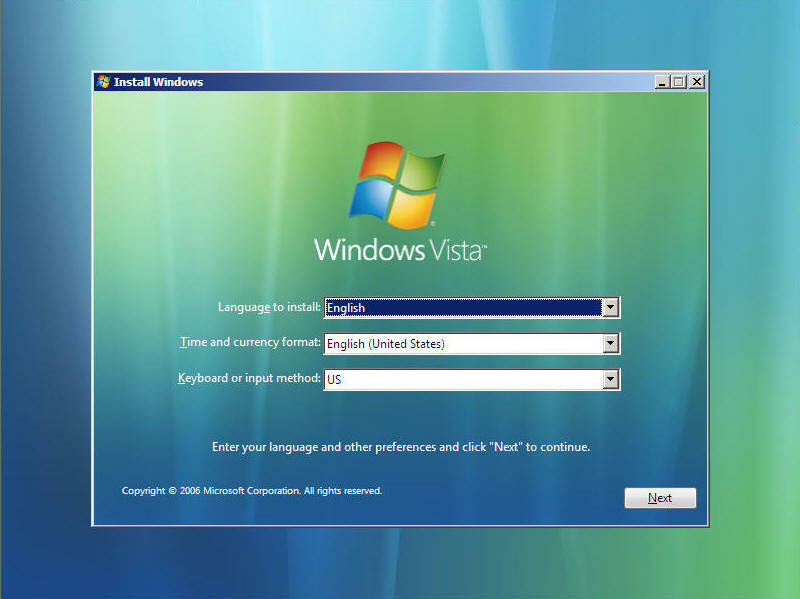 Install Windows Vista in your computer system. Use Windows Vista media center operating system for digital home entertainment. What is operating system? And which are the best operating systems? 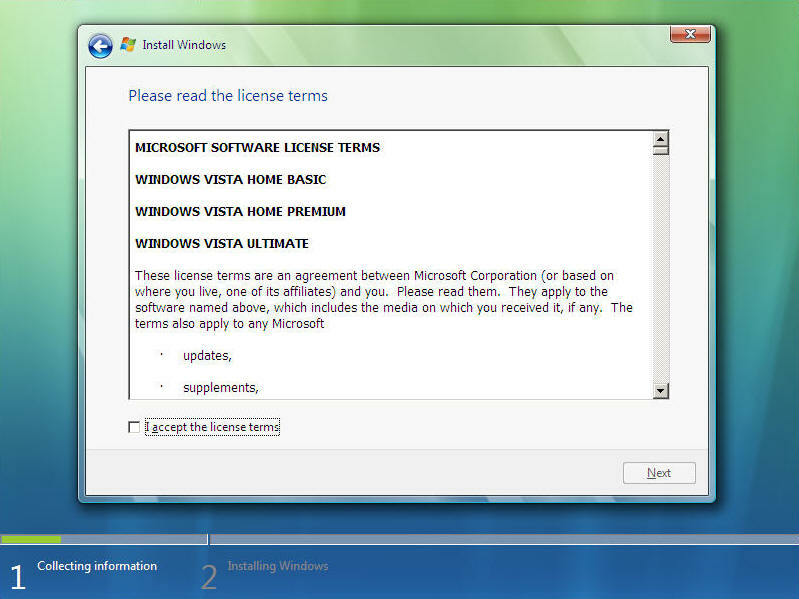 Here are the step by step instructions to install Windows Vista. It's a pretty straight forward install that will take you anywhere from 30 minutes to 3 hours. I have only had one install take longer than an hour, so you should have this done in under an hour. So drop the Vista DVD in the drive, and boot up your PC. Note: This guide assumes a clean install. If you are doing an upgrade from an earlier version of Windows, then you will want to start the upgrade process while your computer is already booted into your older Windows version. Simply insert the Windows Vista DVD into the drive. If you have autoplay turned on, your computer will bring up the starting point for the upgrade. If not, you may need to browse in Windows Explorer to your DVD drive and start the setup manually. 1. 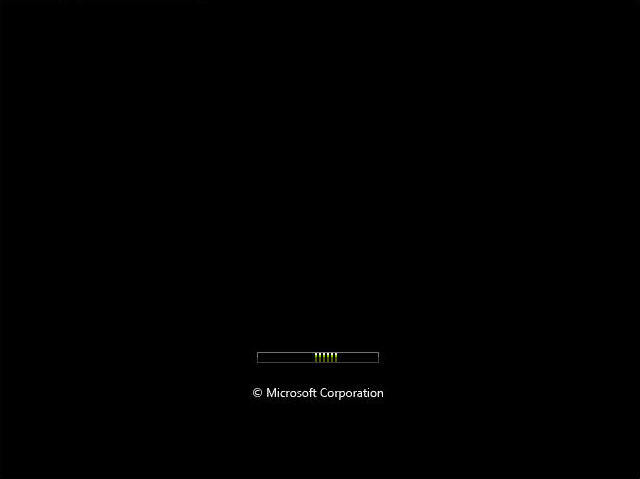 This is the boot up screen that you will see when you start to install Windows Vista. Not much to do here except wait for the next screen to appear. 2. Ok, we have arrived at the starting point. Select the language you want to use, your Time and Currency format, and the Keyboard or input method. Once complete, click Next. 3. On this screen you have the options to Install Now, or do a Repair on a previous install. 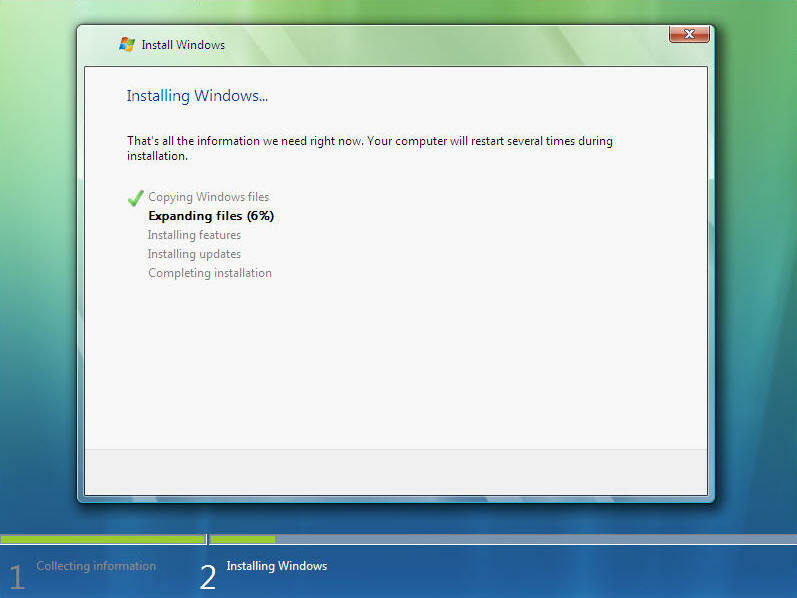 You can also click the "What to know before installing Windows" option. We are doing an install, so click the Install Now option. 4. Yep, it's the good ol' Microsoft License Key page. This is a bit different than XP's license entry page. You technically do not need to enter a license key at this point. 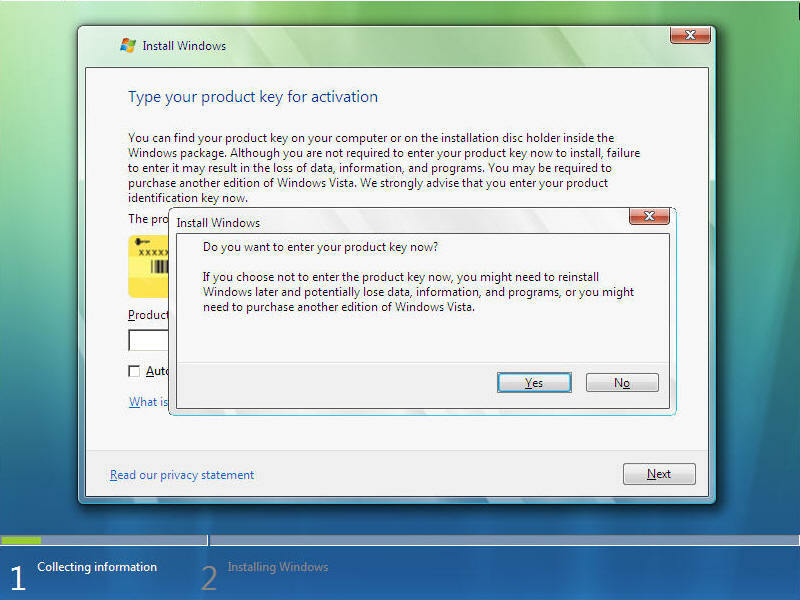 Personally, I would just enter the key, and leave the "Automatically activate Windows when I'm online" box checked. This will cause Windows to activate itself once you install Windows Vista and are online. Keep in mind that if you do not choose to activate your copy, you will receive no support from Microsoft - this includes product updates. So, enter your key, and click Next. 5. If you chose not to enter your license key in the previous step, this window will pop up to verify that you do not want to enter your key. If you select Yes, you will be back on the license key screen. If you click No, you will continue on to the next screen. 6. If you did not enter the license key in the previous steps, you will see this screen next. This will ask you to enter the copy of Windows Vista that you are installing. Note that you need to select the correct version here. If you do not, it warns that you may need to purchase the version you select, or re-install a different version. Once you have your version selected, check the checkbox at the bottom, and click Next. 8. This next screen give you 2 options. You can either Upgrade or do a Custom install. If you are doing a new install from a full version DVD (not the upgrade version) of Windows, then the Upgrade option will be disabled. You will want the Custom option here. Since we are doing a clean install, we don't need to worry about the install wiping the hard drive, as it is already clean. If you happen to be doing an upgrade, then you want to select the upgrade option. 9. 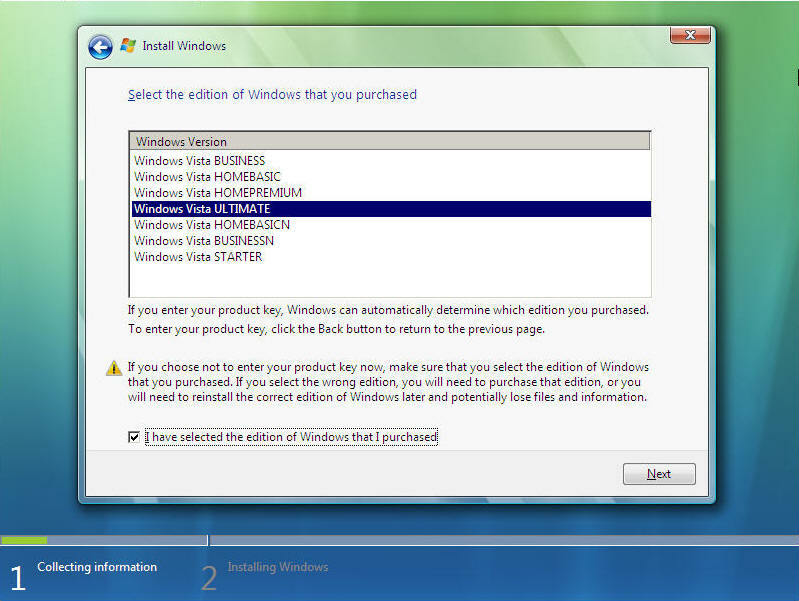 This next screen allows you to select where you are going to install Windows Vista. If you only have a single hard drive, that is what you will see here. 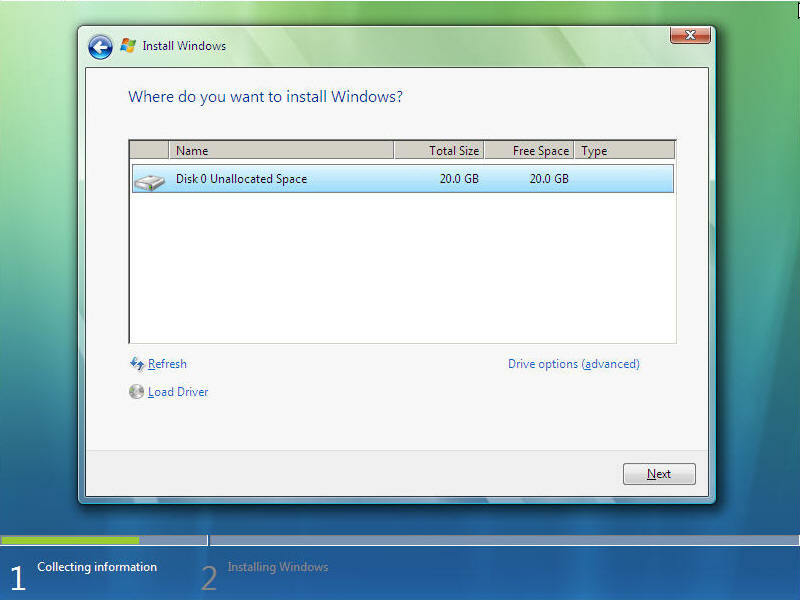 If you are planning to use the entire drive for the install, then simply click Next. If not, then click the Drive Options link. 9a. If you selected the Drive Options link, you will get a screen that allows you to modify the partitions on your hard drive. You can split your hard drive into 2 partitions if you so choose. 10. Now that the setup program has all the information it needs to run the setup, you can sit back and relax. Or go for a walk, play with the dog, get a snack etc... This portion will take anywhere from 25 minutes to a couple hours. Normally however, this will only take 40-45 minutes. That's it! 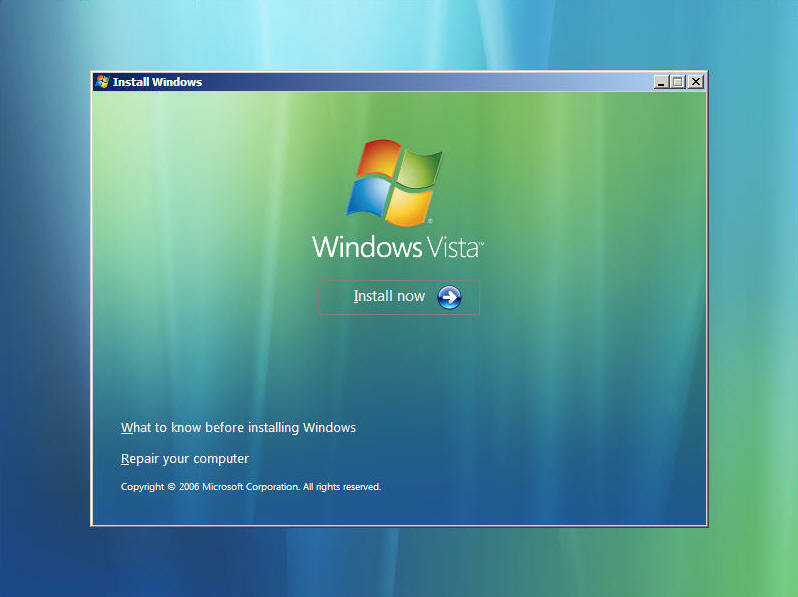 Your install Windows Vista is complete and ready to go. After the last reboot, you will be taken into Vista, and can remove your DVD. Store your DVD and the license key in a safe place. Computer operating systems are regularly updated and released; if you want, or need, to be current, you will need to keep on top of new releases and assess the benefits of upgrading (for example, if you have a home theater pc or are a gaming user then you may want to move up from Windows XP and implement the Windows Vista Media Center edition - which is specifically focused on your user needs). What is operating system (OS)? The OS is program and data software that interfaces between your computer's hardware and other system software. The operating system manages processes and hardware resources and hosts your computer applications. In the computing industry, there is much discussion about what are the best operating systems. I won't answer that here. Microsoft Windows has the major share of the market, and that has pluses and minuses for users. Visit Install Windows XP if you want to understand how to install XP.